The history of fonts on computers is quite long, quite complex and also oddly acrimonious, but it does all come back to the Mac. Specifically, it comes back to Steve Jobs who dropped out of college yet stayed on campus and tried out different courses including a calligraphy one. "If I had never dropped in on that single course in college," Jobs later told Walter Isaacson, "the Mac would never have had multiple typefaces or proportionally-spaced fonts. And since Windows just copied the Mac, it's likely that no personal computer would have them." We owe a debt to that college class, then, and usually we also unthinkingly owe one to the Mac's designers who made fonts so easy. It is so preposterously easy to use and install fonts on a Mac that there's a good chance you've never had to think about it. And that's why when it goes wrong, things are hard to fix. It's not as font problems are an arduous job to fix but they aren't obvious. There are points where the Mac will warn you something is wrong and you just cannot discover what it is. Plus the reason you typically discover something isn't working is startling. Maybe you just installed a client's font for a job you're doing in Adobe InDesign. The absolute worst you can imagine is that InDesign might not like it. And instead, this is what you can see. That's the regular AppleInsider front page and one font problem has made everything unreadable. It's not as if AppleInsider even uses the font that has gone wrong, either. With one font issue on your Mac, everything can render like this. 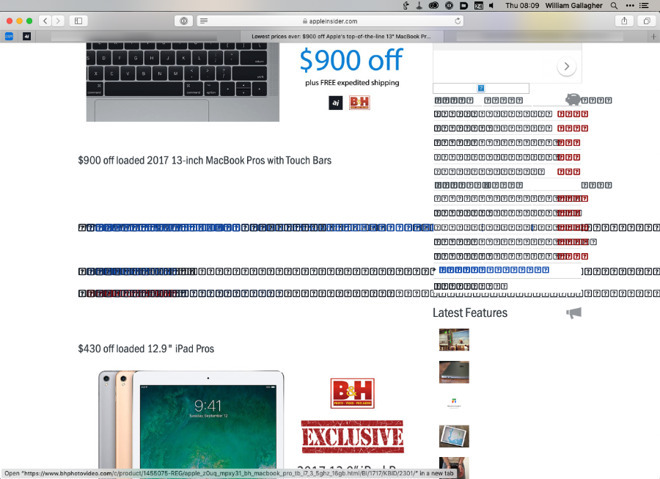 When it happens, it tends to either be visible in your web browser or in Apple Mail. In either case, you can select this incoherent stream of question marks and when you then paste them into, say, Word, all of the text becomes readable. So if it's just happened to you and you absolutely have to get this text out to a client, you do have that temporary workaround. Select All, Copy and then paste into some other applications. You can't work like this for long, though. You need a permanent fix and while there can be many reasons the problem has come up, the solution does tend to be the same. 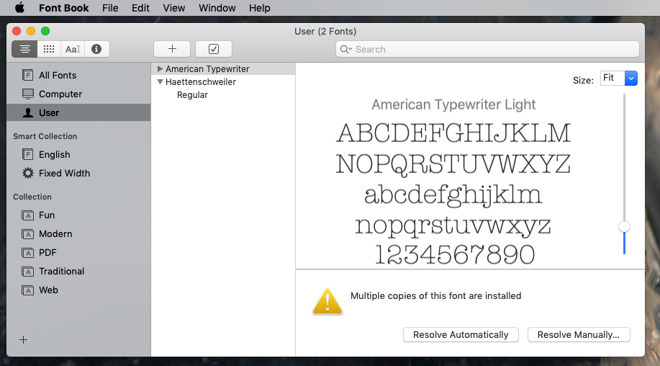 There are apps that install fonts on your Mac but those don't tend to cause the problem. Adobe's apps, for instance, will tell you that they need such and such a font and then they will download it from Adobe's servers. They'll also install it into your Mac and all you've had to do is click OK.
For anything else, any other circumstance, you're using the Font Book app that comes with macOS. There are other tools by third-party companies but usually even if you drag a font attachment out of your client's email and double-click to install it, the Mac is using Font Book. When you do this or when you open the Font Book application and choose File, Add Fonts, you'll see a regular progress bar as it works. And then you might also see a warning. If you're installing a single font and you get a warning then it practically doesn't matter what that warning is, you know which font it's about. You can also use Font Book, though, to add very many fonts at once and when you do that, it's slightly less clear what's causing the problem. It takes some digging to find what the "minor problems" are. It's a bit of a mixed message here. Saying that "minor problems were found" is one thing, but then "proceed with caution" feels like it's just ramped up the danger a bit. It would be better if the error message actually told you what the problem was and which fonts it was about. 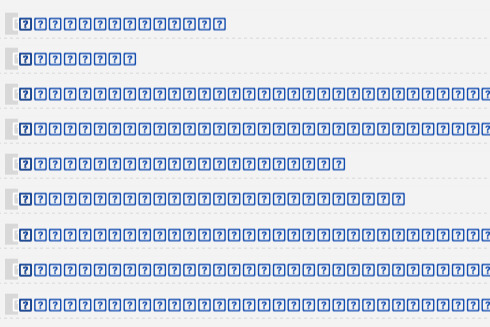 You can tell which ones are involved by looking at the status icon to the right of each font in the list. Most will be green ticks but you'll also see the odd yellow triangle with an exclamation mark in them. These are of course the fonts that are for some reason troublesome but let us tell you the reason since these error messages don't. The most likely problem is that you already have these fonts. You can use Font Book to export typefaces as easily as you can import them with it. So maybe you were moving to a new Mac and over the years had accrued hundreds of specialist fonts. Rather than schlep through exporting each one individually and then importing each one individually, you would export them all. And you would expect Font Book to notice when this means you're adding ones that are already in the Mac's standard set. It does notice. That's what the "minor problems" usually are. Typically the reason you're getting these warnings and the reason Safari is going insane is that you have duplicate fonts. It's hard to understand why it would cause such a problem and it's harder to imagine why Font Book doesn't point out duplicates as it's installing them. Nonetheless, it doesn't stop you and if you do get duplicates, you can get this problem. If you then remove the duplicates, the issue goes away. but if you duplicates, you can get this and if you remove them, the issue goes away. Before you try to fix this issue, make yourself a backup copy of all your fonts. Open Font Book, click on All Fonts, then click on any of them in the list and press Command-A to Select All. Then choose File, Export Fonts and save them all to somewhere on your Mac. Underneath where it says All Fonts, Open Font Book has a section marked User. Click on that and it brings up a list of all the fonts that you have installed. It's a list of every font you have that didn't come as standard with your Mac. All you'll see is a list of fonts in the next column but click on each one in turn and eventually you'll hit a screen like this. It seems a little ridiculous to have to manually press a button that's labelled Resolve Automatically. However, you might as well click it because 'resolve' just means 'remove'. Font Book will automatically remove the duplicate font file or at least it will when you first click on Resolve Automatically and then confirm you want one copy to be moved to the trash. If you instead press Resolve Manually, you'll see some metadata about when the fonts were installed and you'll see that one or both are labelled as Active. Maybe that helps you in some way, but you're going to end up checking that the box marked Resolve duplicates by moving duplicate font files to the Trash is ticked. And then you'll click Resolve All Duplicates. It doesn't work the way you'd expect, though. Resolve All Duplicates doesn't just chuck the lot in the bin, it really just throws away the first duplicate it finds. If you have a font with many different faces in it such as Bold or Oblique then you can end up having to go through the process of finding the font and choosing this option repeatedly. So if Resolve All Duplicates does not remove the warning that there are multiple copies of the font installed, choose Resolve this Duplicate. Click that, then click to say OK, you do want the duplicate moved to the trash, and repeat until it stops asking you. If even that doesn't rid you of the duplicates, there's another step you can take. Back in the main Font Book view with User selected, click on the font that's causing problems. Right click and from the menu that appears, choose Remove "Font Name" Family. There is the option in that same menu to resolve the duplicates but you've been through that. There's also the option to disable this font and that ought to be as good as removing it. Yet you've got your backup saved away safely somewhere, just destroy this copy. Whichever resolution you follow, you'll end up with the duplicates removed and almost all of the time, your problems are over. Your web browser and Mail both look fine once you've done this with every font that the Mac tells you has minor problems. Except of course you can do all this and find it didn't help. In that case, the next step is to go nuclear on all your fonts and remove everything that didn't come with your current Mac. This is hardly ideal but it can be necessary. Plus, you've got your backup —and Font Book is going to do you another one. In Font Book, click on File and then choose Restore Standard Fonts. Yes, it strips out all the fonts you've so carefully and possibly expensively added over the years, but Mail and Safari or other browsers will now work correctly. Unlike when you choose any of the Resolve options, Font Book here moves all the non-standard fonts out to a new folder it creates called Resolve. So you have a copy of them there. 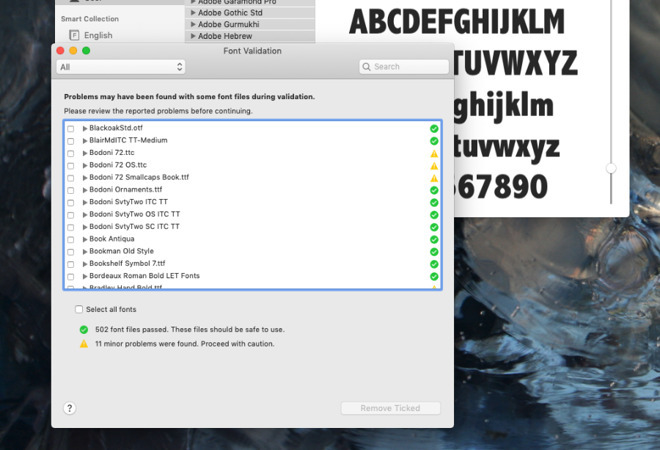 It's not a lot of use to you and your work if the fonts are backed up on your Mac but you can't use them. And if you got into this because a client sent you a font, they need you to use that. So the last job is to put all of these fonts back —just not necessarily all at once. Start with the font from your client. In Font Book, choose File, Add Fonts and just add that one. Look for yellow warning triangles and soon as it's installed, trying to read a message in Mail and go to a new web page in your browser. If it goes wrong, then the problem is not a duplication, it's some kind of corruption in the font file and there's nothing you can do to fix it yourself. You'll have to go back to your client. Next add the rest of your fonts back in the same File, Add Fonts way. Perhaps you should do it one font at a time but we've got no more patience than you have so go on, add the lot back in and see what happens. If you get the problem back, remove them all again and start adding them back in a few at a time. If none of this is truly arduous and none of it takes as long to do as it did to describe, still it's not an instantaneous fix. It's not like you wanted the problem in the first place or are doing all of this because you want to learn how fonts work on the Mac. Yet it does fix the problem and it does make web browsers and Mail usable again.